30 Years Later, Who’s on Top? The CommonWealth Magazine Top 2000 Survey has tracked the evolution of Taiwan’s industrial history over the past 30 years, often identifying paradigm shifts in business trends before they were obvious. Here’s a look back and forward. CommonWealth Magazine’s Top 2000 Survey has reached its 30th anniversary. The survey actually got its start in 1981, when the magazine was first published. Taking a page from Fortune magazine, we ranked the country’s “Top 500 Public and Private Manufacturers” that year. In 1986, the survey was broadened to a format that more closely resembles the present-day version. It was expanded to rank the top 1,000 manufacturers and also covered the 200 biggest service sector companies and the 100 biggest companies in the financial services sector. From that point on, the CommonWealth Magazine Top 1000 Survey evolved into the most faithful and comprehensive record of Taiwan’s corporate development. In looking back over the past 30 years of this survey of Taiwan’s biggest corporations, not only was it never interrupted, it was even expanded in 2013 to the Top 2000 Survey, reflecting the vitality of the country’s private sector and its stunning growth. Taiwan’s corporate growth has been nothing short of incredible over the past 30 years. The combined revenues of Taiwan’s top 1,000 manufacturers rose from NT$1.6 trillion in 1986 to NT$26.4 trillion in 2015, a 16-fold increase, and the revenues (NT$4.4 trillion) of 2015 king of the hill, Hon Hai Precision Industry Co. (better known around the world as Foxconn), were nearly triple those of the 1986 Top 1000. First, even if they are not state-run enterprises with strong monopolistic tendencies, they generally have achieved absolute dominance in the market for at least one major daily necessity after building up a position that erected a very high threshold to entry for potential competitors. Under such circumstances, even aggressive late entrants to the market from Taiwan or abroad have been hard-pressed to budge the dominant player from its position. Second, they all have complex networks of subsidiaries and affiliates in other sectors, leaving them less vulnerable to a downturn in any one field. The Far Eastern Group, for example, which has been in business for more than six decades, has about 250 subsidiaries, two of which have made it onto this exclusive list of companies that have achieved sustained success–Far Eastern New Century Corp. and Far Eastern Department Stores Ltd.
Third, because of their long histories, most of these companies have dealt with succession challenges and handed over power to the younger generation. That has generally meant they have instituted sound and comprehensive management mechanisms. Such systems greatly reduce the potential for individual mistakes and encourage giving authority to professional managers, resulting in strong management teams and better-run operations. Finally, they all have something business leaders often give lip service to but find difficult to instill – a strong corporate culture. “Within our system, we rarely have somebody who suddenly has problems or goes awry,” said Far Eastern Group Chairman Douglas Hsu in an interview with CommonWealth Magazine last year. He stressed at the time that while management systems played a key role, the most important factor was the leader’s philosophy and aspirations. “It’s like me stressing innovation, innovation, innovation every day. By doing that, people will move in that direction and follow the spirit of this group,” he said. Hsu pointed to the Formosa Plastics Group as an example of this, saying the company’s emphasis on costs and efficiency was derived from founder Wang Yung-ching. The company has run into some safety problems since he died, but its strong management system straightened out the difficulties, Hsu argued, crediting the mechanism in place to Wang’s foresight. John T. Yu, chairman of engineering services company CTCI Corporation, agrees that a company’s DNA is what enables it to be big, enduring and stable. “It’s like Volvo at car shows early on. Aside from displaying its latest models, it would also show a wrecked car to highlight that safety was part of its DNA,” Yu says. Aside from the 30 giants that have remained at the highest level of Taiwan’s corporate world for three decades, there are several other domestic enterprises that still need time to prove they can forge a sounder way forward in an intensely competitive environment. What is clear from past Top 2000 Surveys is that companies in every era face challenges they must overcome, and past success is no guarantee of future growth. Looking back at the 1986 list, the leading manufacturers were from the petrochemical, food, transportation and textile sectors. Nobody called them “old economy” sectors at the time because “high tech” had yet to crash the party. The Hsinchu Science Park had only been around for six years, and Taiwan Semiconductor Manufacturing Co. (TSMC) was still a year away from becoming a reality. As for the Top 1000 Survey, not only were several major sectors such as “semiconductors,” “telecommunications” and “optoelectronics” not yet represented on the list, even the electronics industry and computers and peripheral accessories did not have their own categories, being treated instead as part of the “electrical equipment” sector. Yet, signs existed that a seismic shift in Taiwan’s mainstream industries was already quietly afoot. Among the top 100 manufacturers in the 1986 rankings, the “electrical equipment” sector was better represented than any other field and included such big household appliance names as Tatung Co., Panasonic Taiwan, Sampo Corporation, TECO Corp. and Philips Taiwan. There were also “quasi high-tech firms” such as Texas Instruments, Digital Equipment Corporation and Wyse Technology Taiwan Ltd. Many other companies outside the top 100, led by Hon Hai, would be at the vanguard of Taiwan’s industrial history over the next 30 years. Hon Hai made the Commonwealth list for the first time in 1986, ranking 967th with revenues of NT$280 million. Other rising stars on the list included Inventec Corporation, Acer Inc., Compeq Co., United Microelectronics Co., Qisda Corporation, Delta Electronics Inc., and Mitac International Corp. They would all successfully shift their core businesses from telephones, calculators and even electric toys to personal computers and build large, highly respected enterprises. 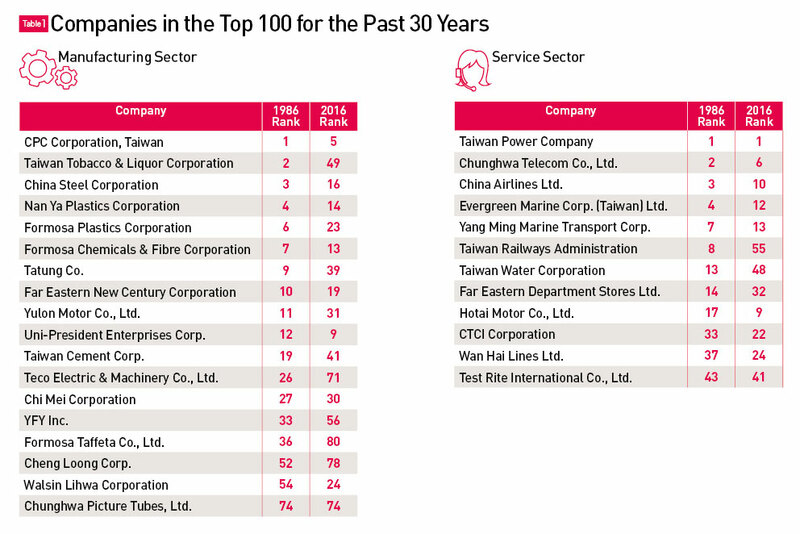 The new trend was also clearly unfolding in the service sector, even if 95 of the 200 biggest service companies in 1986 were trading companies, and the top 10 was dominated by state-run enterprises. On that year’s list were four big players in the information equipment sales and services sector – Hewlett Packard Taiwan, Acer, Qware Communications Co. and the Aurora Group. The pace of change accelerated in the following years. Taiwan entered the information and electronics era in the early 1990s with government support, and companies such as Acer, Delta Electronics and the so-called big five contractors – Hon Hai, Pegatron Corp., Compal Electronics, Quanta Computer Inc. and Wistron Corporation – eventually displaced the former standard-bearers at the top of CommonWealth’s annual survey. A similar phenomenon was seen in the service sector. Once dominant state-run enterprises gradually ceded their places at the top, in some cases to marine and land transportation companies but mostly to companies specialized in the sales and service of information equipment, such as Acer, Synnex Technology International Corporation, WPG Holdings (formed in 2005 from the WPI Group and SAC Group) and others. The rise of President Chain Store Corp. (which operates 7-Eleven convenience stores) and department store operators also signaled that Taiwan had entered a new consumer era. The top 100 rankings at 10-year intervals provide an even clearer picture of how Taiwan’s mainstream sectors have trended and will be reshaped in the future. First, the manufacturing sector. The most represented sector in the top 100 in 1986 was the electrical equipment industry, with 26 companies. In 1996, the category was split into two mainstream sectors – the “electronics” and “information and communications” sectors – and companies in those businesses occupied 46 of the top 100 spots. Fast forward to 2006. By then, the development of the information and communications sector was at its peak, and was further divided into the “semiconductor,” “computer system,” “computer peripherals,” “optoelectronics,” “communications and the Internet,” “electronics” and “home appliances” categories. Companies in those fields assumed 60 of the top 100 spots, signaling the industry’s golden age. This year, although the information and communications industry added a new category – the IC design sector – and still had the majority of Taiwan’s top 100 manufacturers, it occupied only 57 of the top 100 spots, three fewer than 10 years earlier. The same approach in the service sector yields an even clearer picture of the rise and fall of Taiwan’s mainstream services. Trading companies accounted for a third of the 100 biggest service companies in 1986, followed by automotive sales and service. By 1996, the construction sector had gone mainstream, while the number of trading companies in the top 100 had plummeted to 15, nudged aside by the rise of 13 retailers and eight companies in the information equipment sales and service field. Mirroring the manufacturers’ top 100 in 2006, the ranking of the top 100 service companies signaled the ascendance of the information and communications age. The “information and communications and IC distribution” sector led the top 100 with 21 companies, and the “information equipment sales and service” sector was represented by 11 companies. This year, “information and communications and IC distribution” companies showed signs of retreating while the “travel and restaurant” sector appeared in the top 100 for the first time with three enterprises. In addition, new sectors such as “software” and “e-commerce” each had two companies make the cut, a harbinger of the types of companies that will be the next major drivers of the economy. In chronicling the evolution of Taiwan’s businesses over the past 30 years, CommonWealth Magazine’s Top 2000 Survey has not only recorded companies’ explosive growth but reflected looming economic concerns, including the possibility that a “mediocre economy” may be the new normal. “Leaning on China’s market in the 1980s helped Taiwan grow more than 10 percentage points. Now there are far fewer opportunities,” says Andrew Kuo, the previously vice chairman of Blackstone Greater China and now founder and CEO of Zoyi Capital. China was once a new frontier that could be exploited by Taiwanese enterprises, but it has now begun replicating Taiwan and even surpassing it. The changing fortunes of petrochemical company CAPCO Co. (China American Petrochemical Co.) reflect that history. 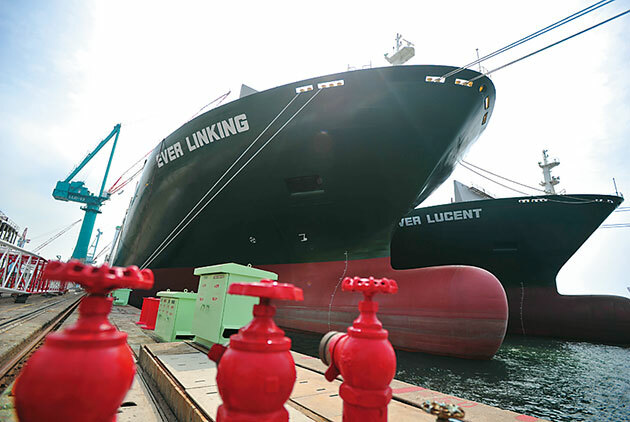 CAPCO, a joint venture between Taiwan’s state-run oil giant CPC Corp. Taiwan and BP plc (British Petroleum), produces PTA, an upstream raw material used to make chemical fibers. In 1986, it ranked 14th in the top 1,000 and was the leading foreign enterprise. Less than 30 years later, however, CAPCO was forced to cut capacity, lay off workers and even close down its factory in Kaohsiung, once the world’s single biggest PTA production base, because China set up its own large-scale PTA plants. CAPCO fell out of the top 100 for the first time in 2014 and disappeared from the list this year after deciding to no longer participate in the Top 2000 Survey. The service sector is also facing the prospects of stagnation. Wen Chao-tung, a professor in National Chengchi University’s Graduate Institute of Technology, Innovation & Intellectual Property Management, observes that from 1999 to 2013, the top 10 service companies were pretty much the same year after year. Also, outside of CTCI Corp., China Airlines and EVA Airways, the overseas performance of Taiwan’s service companies has been far below expectations. What Wen meant by “digging deep” is that companies should have the boldness and courage to strive to become the leading player in their respective fields. Chiu Yi-chia, chairman of National Chengchi University’s EMBA program, believes predicting what new businesses and industries will look like in the future is nearly impossible because of today’s high degree of convergence of new technologies and new platforms. He suggests that the government be open-minded and allow companies to try different models and possibilities. President-elect Tsai Ing-wen, who will take office on May 20, has already highlighted five main industries that her administration intends to aggressively promote: green energy, national defense, biotechnology, the Internet of things and smart machinery. But some scholars are pessimistic that a policy-driven growth model can be effective. “In the past, the government used the approach of picking winners to develop the petrochemical and semiconductor sectors, but since the semiconductor sector, it has not picked any winners. The “two Trillion-dollar industries,” “digital content” and others have not been effective,” Wen said. The past 30 years have proven that Taiwanese businesses are capable of finding their own way forward, Wen said, and he suggested that the government might be better off focusing on how to provide assistance or a regulatory environment that will unleash the potential of these companies instead of jumping into the fray and telling them the direction in which they should go. The Top 2000 Survey actually covers more than 2,000 companies. CommonWealth Magazine’s 2016 Top 2000 Survey was based on publicly available data or on questionnaires that asked companies for information on their 2015 financial results. The top 1,350 manufacturers, the top 650 service companies and top 100 financial services are ranked based on their 2015 revenues. Taiwan’s 16 financial holding companies are ranked based on net revenues. Aside from the rankings, other financial indicators, such as revenue growth, after-tax profit, profit margin, return on equity and debt ratio, have been used to assess the overall performance of the manufacturing, services and financial services sectors and of individual industries. The data is also used to rank the top 50 companies in both the manufacturing and services sectors and top 10 companies in the financial services sector for fastest revenue growth, highest profits and highest profit margins. There is also a list of the 50 companies with the best operating performance across all sectors.